It still feels strange to see Shea Weber in a Canadiens uniforms—he might’ve been the only player in franchise history to look right in Predators yellow—but at least the building and the crowd and the cheers were familiar. After 11 seasons there, Weber played his first game back in Nashville since a stunning offseason trade that sent the cornerstone defenseman to Montreal in exchange for P.K. Subban. And then, down 0-1, Weber took a pass in the slot from Alexander Radulov (another former Pred, who twice left for the KHL and who was booed every time he touched the puck) and fired it through traffic to tie the game up. 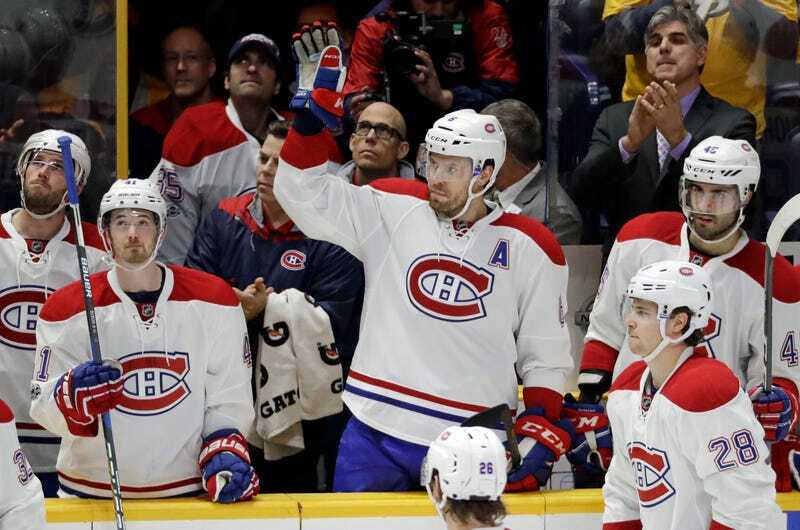 Montreal would go on to win 2-1 on Max Pacioretty’s overtime goal. It’s obviously far too early to try to evaluate the Weber-Subban trade. In terms of points-per-game, they’re about even. But the Habs are rolling, and Weber, who was immediately made an alternate captain, has fit in perfectly. They knew what they were getting in Weber, and they’ve gotten it so far. The Predators, meanwhile, are stumbling—they’re just on the outside of the playoff picture. And Subban has missed time with injury—he didn’t play last night and is expected to be out another couple of weeks with a herniated disc. But Subban, 27, is four years younger than Weber, which is why most observers thought Nashville got the better end of the deal. There’s still plenty of time for that to prove true, but right now it’s a heck of a lot more fun to play for and root for the Canadiens.